Have you noticed a shift in how we are approaching our daily lives? We’re searching for ways to declutter every aspect of our lives from buying fewer material goods to focusing more on experiences. We seem to be craving a less complicated lifestyle that rewards us in ways beyond instant gratification. Appreciating the details that we’ve lost track of in the recent past is a gaining in interest. We’re back to meditation, slow cooking movement, knitting and yes, Marie Kondo has taught us the art of tidying up not only physically with our closets and drawers but also mentally in our lives. Canadian app Miniminus (available on iOS and Android) recently came to my attention. As a parent, I was interested in how this storytelling app can engage and inspire the youngest readers while fostering that connection between child and storyteller. Sure, there are lots of storytelling apps out there that will do all the work for you. Just press start. But if you’re looking for a way to encourage and nurture a child’s imagination and share in that space with less distractions this app is worth looking into. Reading a story aloud helps create unforgettable moments, and allows children to not just watch or listen but to become a part of a different world. No extra voices, music or sounds required. The app has taken away a lot of the bells and whistles we’ve been so accustomed to seeing when it comes to storytelling on various digital platforms. Why did you decide to go that route? YK: We decided not to include music, voiceovers or sound because we want to foster the reading experience by minimizing possible distractions. We wanted a platform that allows the parent to read stories on a tablet at bedtime without losing the peace and quiet associated with reading a paper book. For the same reason, we have taken great care to create a super simple user interface that allows access to stories directly. That said, our platform still allows us to tell stories in a visually dynamic way (fade-in, fade-out, travelling, popup, etc.). The best of both worlds, in a way. How are you sourcing these stories and what are you looking for? YK: All content published on Miniminus is entirely original and was created specifically for our platform. We hand pick the authors with whom we want to work. We’re looking for bold, funny, intelligent, poetic and original stories for children ages 3 to 8. We publish 25 new stories per year. Can the authors pitch stories to you – just like they would in traditional book publishing? What’s the process? YK: Yes, authors can pitch stories. Our editorial committee will read them carefully and reply as soon as possible. The membership is $3 CDN per month. Are the stories then accessible off-line as well? 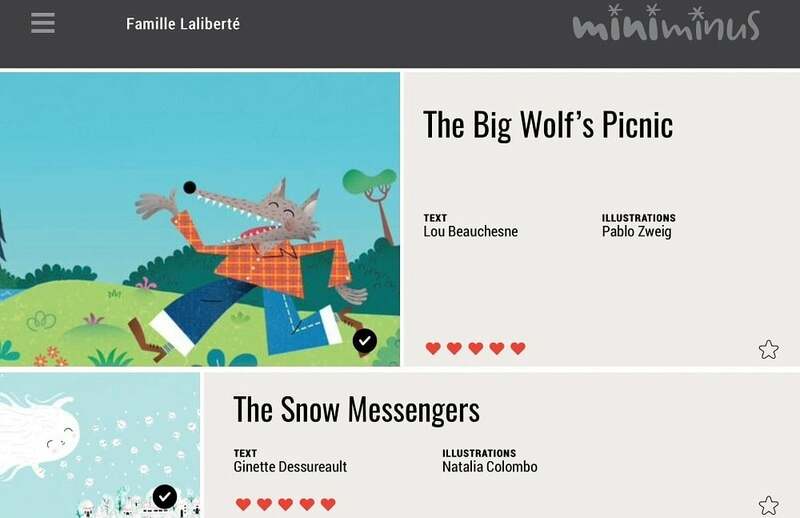 YK: Subscribing to Miniminus, although very inexpensive, allows you to read all published stories online and offline, once they have been downloaded. Our business model is similar to that of Netflix, a subscription gives access to all content. There are no additional in-app purchases. App users will be able access the same stories translated in six different languages. Tell us more about that concept? YK: We are not a typical publishing house. In fact, there is nothing typical about the way we work. As you already know, we’re a startup. We’re a new publishing company of children’s pictures stories, 100% digital and 100% original. We are building this company from the ground up, based on ideals and ideas. We are rethinking the author-reader equation. We associate with creative authors (writers and illustrators). We develop original and innovative content. And we distribute these stories through our app. The readers have access to this exclusive content via subscriptions, and the profits are jointly shared with the authors. More precisely, 50% of the company’s profits are split among the authors. More subscriptions equal higher revenues. The higher the revenues, the more money authors make. We publish all our stories in six languages to encourage children to learn other languages and to reach as many readers as possible.